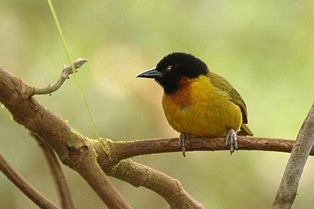 The Strange Weaver Ploceus alienus is common in montane forest along the Albertine Rift. The adult (photo above right, from wikipedia) has the head, neck and bib on the breast black, with a chestnut band below the bib. 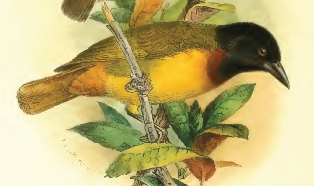 The female is similar but the black ends on the throat, and the breast is chestnut. Young birds are green above, yellow below, and with a golden brown wash on the chin and throat. The species was described in 1902 by Bowdler Sharpe as Sitagra aliena, where aliena means alien or strange. Sharpe considered it as strange because it did not clearly fit into any of the many weaver genera known at the time. The English name for this species was Alien Weaver for several decades before becoming Strange Weaver. It was first illustrated by Shelley in a book (1905, The birds of Africa, comprising all the species which occur in the Ethiopian Region. Vol. 4, Part 2) (above left). No subspecies of the Strange Weaver are recognised. It occurs in DR Congo, Uganda, Rwanda and Burundi (see map left, based on Birds of Africa). This species is an understorey skulker in montane forest at 1500-2700 m. It generally forages in pairs low down in clearings, secondary growth and dense understorey usually below 5 m. It joins mixed-species flocks, associating particularly with Dark-backed Weavers. The Strange Weaver feeds on insects and invertebrates, and also eats berries and some seeds. The Strange Weaver is solitary and monogamous, probably having a permanent pair bond. The nest (photo left, from phown 2896) is retort-shaped, with a short entrance tube pointing outwards, rather than straight down. Both sexes build the nest, primarily using thin tendrils of creepers, with some fine strips of grass. The coils of the short tendrils interlock. The nest is suspended from the tip of a branch 3-10 m above ground or over water. Branches near the nest are stripped of leaves and twigs. A pair may have 2 nests close together. Clutch size is 2. 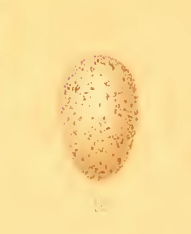 The eggs are creamy white with some grey shading, irregularly speckled with reddish-brown (figure right, from Ogilvie-Grant WR. 1910. Ruwenzori Expedition reports. Transactions of the Zoological Society 19:253-480). There are 3 PHOWN records (see PHOWN summary), from Rwanda and Uganda. Many more PHOWN records are needed for this common species. Old nests may be used for breeding by the White-collared Oliveback Nesocharis ansorgei, so look at old nests too. Submit any weaver nest records to PHOWN (PHOtos of Weaver Nests) via the Virtual Museum upload site.